The draft bill to “transform” test prep schools (dershanes) into formal private schools was submitted to the Turkish parliament last week. The mooted closure of dershanes – many of which are operated by sympathisers of Islamic scholar Fethullah Gülen – is widely interpreted as an Erdoğan-lead strike against the Gülen movement, and seems to have been the trigger leading to the Gülenist-led corruption probes that have targeted figures close to the government since December. The precise effects that a closure of the dershanes would have aren’t clear, but it’s reasonable to assume that it would significantly affect the reach of the Gülen movement and its influential media arms. Gülen-affiliated outlets probably aren’t commercially viable as independent entities, but they are useful as public relations arms for the movement’s wider interests. In this sense, the business models of the pro-Gülen media – mostly controlled by either Feza Publications or the Samanyolu Publishing Group – aren’t dissimilar to those of mainstream government-friendly titles: Losses can be accepted in consideration of a bigger picture. Those losses will be far more difficult to sustain without the profits flowing in, directly or indirectly, from dershanes. As U.S.-based press watchdog Freedom House stated in its report on Turkey published Feb. 3: “Media outlets are used to promote their ownership group’s financial interests … Members of the media and the government alike describe newspapers’ Ankara bureau chiefs as ‘lobbyists’ for their companies.” Owning a media outlet isn’t profitable in itself, but it helps to have one in order to facilitate business in other sectors; at least a dozen newspapers and 10 television stations are owned by conglomerates with energy, construction or mining interests, all sectors heavily dependent on government business. Moguls are willing to temporarily handle the losses involved in owning media groups – and are often encouraged to do so by the government – as they know that other business benefits will follow (in the winning of construction tenders, for example). As such, their number one priority is usually to protect their good relations with the government. The Gülenist media is useful as a lobbyist for the Gülen movement’s interests in the same way that the pro-Erdoğan media lobbies for the government’s (and their own companies’) interests. Media outlets don’t necessarily have to be profitable to make commercial sense. For example, the pro-Gülen Zaman newspaper has the highest circulation figures of any Turkish newspaper, but these figures are mostly made up of subsidised subscriptions. It’s not uncommon in Turkey to see copies of Zaman left in the lobbies of apartment buildings or tucked into the gates at the entrance of a shop or a residential site. Thousands of copies are also sent, solicited or unsolicited, to businesses with ties (either tight or loose) to Gülen. According to figures that I noticed last year, only a tiny fraction of Zaman’s circulation figures come from actual sales. I don’t know about online and print advertising revenue, but it’s clear that a profit can’t possibly be run when sales are so low and subsidised subscription is so high. But the value of Zaman lies in more than just headline profits – the paper is part of the broader Gülen movement eco-system. Zaman is owned by Feza Publications, which is a partner organisation of the Samanyolu Publishing Group; between them, they operate dozens of newspapers, websites, TV stations, radio stations and magazines, both in Turkey and abroad. These don’t directly come under the umbrella of a wider holding company operating in other sectors, as most of the mainstream pro-AKP media does, but the relationship is similar. All Gülen media groups are supported directly and indirectly by profits from other Gülenist business interests. Without the financial support provided by the operation of the dershanes, the Gülenist media would find it more difficult to sustain itself. Joshua Hendrick, the author of the most respected book on the Gülen movement so far available in English, has suggested that the move to close the dershanes primarily aims to “[go] after the existential nature of the movement by destroying its human resources.” The financial ramifications of a closure of dershanes would also be significant. The Gulenists run 2,000 schools in 160 countries, and Hendrick estimates that the Gülen-affiliated charter schools in the U.S. alone bring in around $500 million per year. Although they are primarily seen as a means of attracting new sympathisers, the hundreds of Gülen-affiliated dershanes in Turkey also make up a multimillion-dollar industry. On both human and financial fronts, therefore, a dershane closure – which the draft just submitted to parliament ensures would be completed by September 2015 – would likely have big ramifications for the Gülen-affiliated media. Not so many years ago, a strategic partnership between Turkey and Iran seemed to be developing into one of the region’s more unexpected modern developments. Turkey was vaunted as a mediator in negotiations between the West and Iran over the latter’s nuclear program, and the relationship was reinforced by crucial oil and gas sales from Iran to Turkey. Those days feel rather long ago. The two countries now find themselves at loggerheads backing opposite sides of the bloody civil war in neighboring Syria, with fears of a regional sectarian conflagration steadily turning into an apocalyptic reality. A marker of the Syrian crisis’ deleterious effect on the Turkey-Iran relationship came with the diplomatic spat that followed the deployment of NATO Patriot missiles on Turkey’s southern border earlier this year, which lead the Iranian army’s chief of staff to declare that the move could be a prelude to “world war.” Less spectacular, but also very important, is Iran’s clear unease with Turkey’s delicate ongoing peace process with the Kurdistan Workers’ Party (PKK), which involves the rebel group withdrawing its militants from Turkish soil to their bases in northern Iraq. Tehran is concerned that the withdrawal could result in the militants joining forces with the Party of Free Life of Kurdistan (PJAK), which is the PKK’s offshoot in Iran. The schism between Turkey and Iran widened to such an extent that Patrick Cockburn recently described relations between the two as “poisonous,” and this is increasingly being reflected in the rising levels of anti-Iran sentiment in Turkey’s Islamist press. In addition to countless pieces targeting Iran for supporting the al-Assad regime in Syria , it has also been striking to see the AKP media include Iranians among the dark “outside forces” stoking the recent Gezi Park protests, supposedly out of discomfort with Turkey’s economic success. In the early days of the demonstrations, it was eagerly reported in all government-supporting media outlets that an “Iranian agent” had been arrested on suspicion of being a “provocateur” behind protests in Ankara. It later emerged in more sceptical news organisations that the individual concerned, Shayan Shamloo, was in fact a rapper who was living in Turkey as a refugee. However weird, Bozkurt’s column wasn’t an outlier in pointing the finger at Iran for Turkey’s problems. Indeed, Zaman and Today’s Zaman have recently been publishing a steady stream of articles and columns critical of negative Iranian influence in the region, and it’s probably also worth noting here that the Today’s Zaman editor, Bülent Keneş, wrote a book on Iran’s links to international terrorism last year. Much of the Iran-bashing in the Turkish press goes hand in hand with pieces on Turkey’s Alevi minority. The Alevis are an offshoot of Shiism, (distinct from the Alawites in Syria), and have historically been associated by some in Turkey as dangerous fifth columnists with divided loyalties to Iran. Indeed, that association goes back as far as Bosphorus bridge-commemorated Sultan Selim the Grim, whose decision to kill tens of thousands of Alevis was taken during a military campaign against the Persian Safavid Empire in the 16th century. Some of the most enthusiastic and unpleasant examples negatively associating Alevis with Iran come from the extreme Islamist daily Yeni Akit. For two consecutive days in June, for example, Yeni Akit carried front page headline stories claiming that Iranian authorities had invited Alevi religious leaders across the border to visit Ayatollah Khamenei in an attempt to foment sectarian war in Turkey. 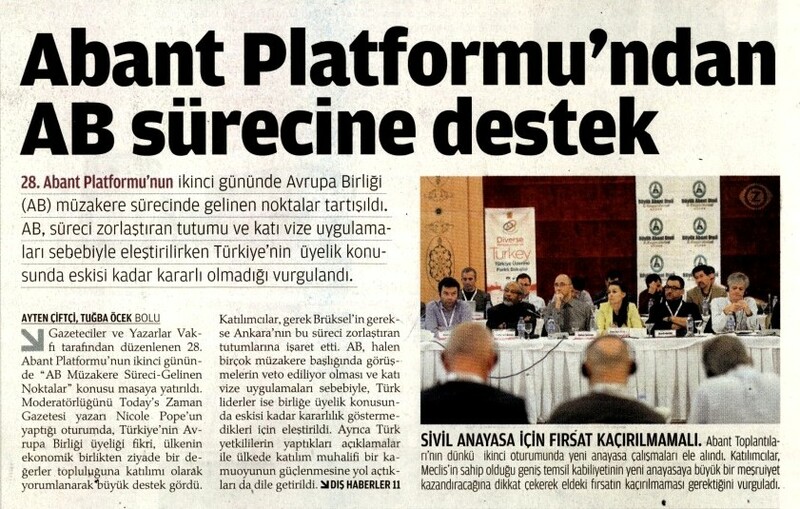 The headline of the first day’s story, “Iran is playing with fire” (İran, ateşle oynuyor), was a stomach-turning play on the Turkish term for “flame” (ateş), in reference the fire often used in Alevi rituals. Of course, it should be stressed that Yeni Akit is far from representative of majority sentiment in Turkey, but it probably isn’t quite as marginal as most people like to think. In fact, a few months ago Erdoğan even put two of its writers – including editor-in-chief Hasan Karakaya – on his “Wise Men Commission,” charged with the august task of repeating whatever he said about the ongoing Kurdish peace process. It all adds up to a worrying picture. With the Syrian crisis having exploded into a wider geopolitical struggle splitting the region on sectarian lines, it’s increasingly clear that the growing schism between majority-Sunni Turkey and majority-Shia Iran is more than just a temporary trend. Erdoğan-Gülen tension bubbles to the surface again? A new episode in the covert Erdoğan-Gülen power struggle bubbled quietly to the surface last week. The fault line was apparently once again Prime Minister Recep Tayyip Erdoğan’s plan to change Turkey to a presidential political system. I was alerted to this latest possible rift by the May 9 front page of arch-secularist Cumhuriyet, which brandished two recent pieces of evidence: The first was veiled criticism issued by influential U.S.-based religious preacher Fethullah Gülen, broadcast recently on the major Gülenist television station Samanyolu; the second was a column published in the Gülen-affiliated newspaper Zaman, written by “Gülen mouthpiece” Hüseyin Gülerce. “The impression that the AK Party negotiated with the Kurdistan Workers’ Party (PKK) leader, Abdullah Öcalan, in return for the presidential system cannot be fixed … It does not seem possible for the AK Party to convince the people and other stakeholders that the presidential or semi-presidential system is the best option after all these developments. In another plot twist, the vice president of the Gülen-affiliated Journalists and Writers Foundation, Cemal Usak, recently suggested that Gülen “may return to Turkey” if a “civil and democratic constitution” is adopted. Whatever that means in the grand scheme of things, it seems likely that heads will continue to be scratched over the whole issue for a while yet. Having lead a government that has spent much of the last 10 years in a bitter tug-of-war for power with the military establishment, it has recently become clear that Prime Minister Recep Tayyip Erdoğan is now attempting to secure rapprochement with the Turkish armed forces. The latest indication came with his visit on Feb. 9 to the hospital bedside of retired general Ergin Saygun, whose 18-year prison sentence in the Balyoz (Sledgehammer) coup plot trial was suspended on Feb. 7 following a medical report. Saygun is now undergoing critical heart treatment in Istanbul. The Fethullah Gülen religious movement (cemaat) is the strongest and most powerful advocate of the ongoing coup plot trials. As Dani Rodrik, a fierce critic of the Ergenekon/Balyoz cases, has written: “[Erdoğan’s] Gülenist allies … have been the key driving force behind the sham trials. It is Gülen’s disciples in the police, judiciary and media who have launched and stage-managed these trials and bear the lion’s share of responsibility.” Below the surface, it is therefore becoming clear that Erdoğan’s recent moves to normalise relations with the military constitute the latest steps in the power struggle between himself and the cemaat. As a leader with impeccable political antennae, Erdoğan also probably recognises the political importance of “moving on” with the military. Despite all the reputational damage it has suffered over the last 10 years, the national armed forces still retain considerable loyalty among the Turkish public. As the newspaper most closely affiliated with the Gülen movement, it is thus interesting to observe how daily Zaman is reporting Erdoğan’s search for a settlement. 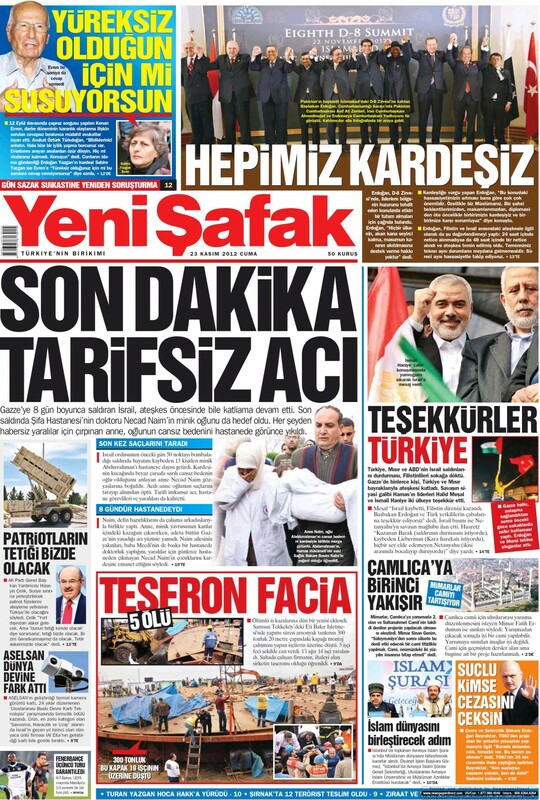 On the day after Erdoğan’s hospital visit to Saygun, the paper’s front page carried a picture of him standing at the former general’s bedside, with an innocuous story inside titled “Surprising visit to Ergin Saygun.” However, it is also worth noting that Zaman’s front page headline on the same day focused on the recent three-day summit of the (Gülen-affiliated) “Abant Platform,” which came out in strong support for Turkey’s continued EU membership negotiations. The piece mentioned the “hardening attitude” within the EU and unfair visa restrictions, but also included criticism of the recent public declarations of some Turkish officials, which it said “lead the way to opposition to EU membership among the public.” Erdoğan has been leading the charge in negative statements about the EU process in recent weeks, so Zaman’s emphasis was perhaps not without significance, hinting cryptically at the growing Gülen-Erdoğan split. Zaman’s circulation figures – the Gülen effect? Daily Zaman is often described as Turkey’s most read newspaper, with its circulation having recently tipped over the 1 million mark. It was therefore rather interesting to see a recent chart on medyatava.com indicating that this figure is made up almost entirely of subscribers, with only around 20,000 copies actually bought in shops every day. This isn’t a complete surprise – for all its faults Zaman has never really been a “populist” newspaper, always self-consciously higher brow than the average fare on the Turkish newsstands. It’s pretty rare to see the local simitçi walking around Istanbul with a copy of Zaman tucked under his arm – at least in comparison with Sabah, Posta, Hürriyet, etc. A similar pattern can be observed at Today’s Zaman, the English-language arm of Zaman, which has 8,500 subscribers to just 1,900 sales. While on the dull subject of newspaper circulation figures, it’s worth taking the opportunity to note that since last month’s shock resignations from Taraf, the paper has seen its circulation increase substantially. While Taraf had previously hovered around 50,000, this figure is now approaching close to 70,000. Whether or not the resignations were good from a journalistic perspective, they certainly seem to have made economic sense. The New York-based Committee to Protect Journalists (CPJ) has just released its annual report on the number of journalists imprisoned globally – a gloomy read. This year, the global tally reached its highest point since the CPJ began surveys in 1990, with a total of 232 individuals counted as being behind bars, an increase of 53 since 2011. Unsurprising to most in the country, Turkey tops the list this year – followed by Iran and China – with the CPJ counting 49 currently in Turkish prisons for their journalistic activity, (still lower than its last count of 61). A complete list featuring detailed accounts of all imprisoned journalists worldwide is available to view via the CPJ here, while a “path forward” for Turkey, drawn by CPJ Executive Director Joel Simon, can be read here. The CPJ recently focused on the situation in Turkey in a detailed report released in October, which I wrote about on this blog at the time. In Turkey, most of the newspapers hostile to the government included pieces on the report, with the reliably bellicose Sözcü referring ironically to Prime Minister Recep Tayyip Erdoğan in its Nov. 12 front page headline: “THE MASTER BREAKS THE RECORD: Turkey is the world champion in imprisoned journalists.” Also tongue-in-cheek, daily Taraf dolefully headlined its article on the report: “Again we’re the world’s first!” However, news of the CPJ report was conspicuous by its absence in the Pollyannaish pro-government press – nowhere to be found in Zaman, Sabah, Bugün, Türkiye, Yeni Asya, Yeni Şafak, or Star. Bearing in mind the Doğan Group’s history with the Justice and Development Party (AKP) government, it is also perhaps worth mentioning that neither of its remaining Turkish-language titles, Hürriyet and Radikal, mentioned the report in their print versions either (although both did feature online articles). Of course, the October CPJ report on Turkey was far more detailed than this latest one, which focused only on the global numbers of journalists in jail. Indeed, the real question of press freedom in the country is rather more complicated than simply a headline figure alone, as I have written before, both here and here. Still, however hypocritical many of the protests on the issue coming from the direction of newspapers like Sözcü are, the situation is certainly deplorable. Complicated as the issue may be, comparing the coverage (or non-coverage) of the CPJ report in the Turkish press at least gives some impression of quite how polarized the media in Turkey really is. Looking at some of the newspapers here, it’s often hard to believe they can be describing the same country. These words might be more convincing if Turkey hadn’t already made such a big play of being a potential mediator, particularly in conflicts such as that between the Israelis and the Palestinians. Conservative Islamist daily Yeni Şafak seems to be offering its readers a comforting fictional parallel universe. 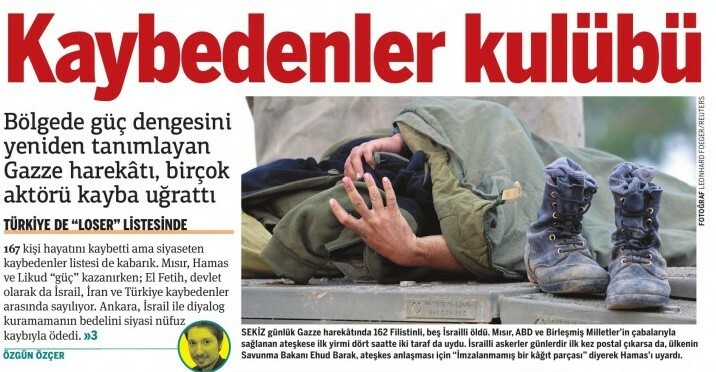 Alongside the requisite headline story about Israel’s “eight-day long massacre,” its Nov. 23 front page featured a box titled “Thank you, Turkey,” focusing on some marginal quotes from Hamas leader Khaled Mashal thanking the efforts of Turkish officials. It went further the next day, boldly stating in a similar front page box: “Without Turkey it wouldn’t have happened,” referring to the ceasefire process. Meanwhile, just a day after being widely praised for his role in the ceasefire, Egyptian President Morsi was being criticized from all sides for his domestic move to assume sweeping new powers, leading to violent clashes in central Cairo. The rapid shift from praise to condemnation was striking. Indeed, while Egypt may – in Foreign Policy’s phrase – have taken over from Turkey as the Middle East’s latest “it” country, it has quickly discovered that this is not an easy role to play.